If you ask my mother-in-law to come over for dinner and she finds out you’re serving soup, she may politely decline. She’s not a rude person; she just happens to believe that soup is not dinner. Soup can be an appetizer or perhaps a light lunch but soup is absolutely, categorically NOT dinner. Incidentally, chili can occasionally qualify as dinner. Because it’s hearty. But a brothy, chicken noodle soup has no hope. 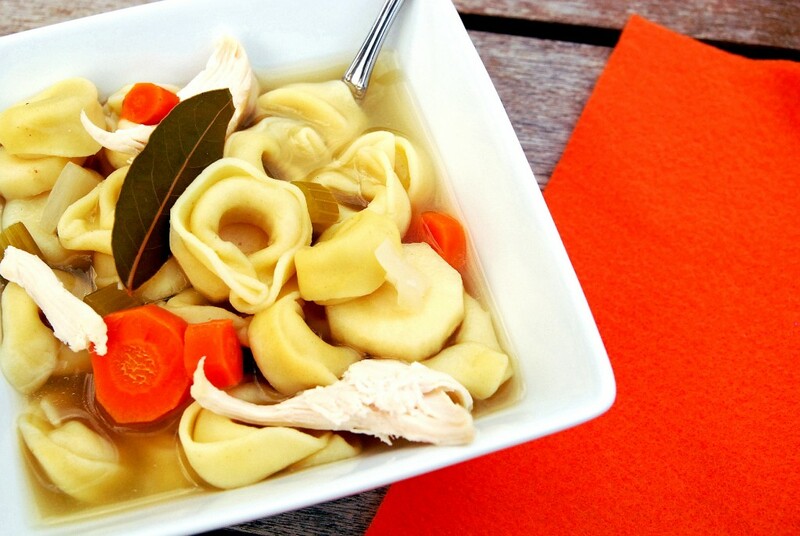 Unfortunately, my kids LOVE homemade chicken noodle soup. Collectively, it is their favorite meal (even though one picks all the celery out and another steals everyone’s noodles). I wondered if I could dream up a version that would keep the kids happy but be hearty enough for grandma. This idea is so brilliant. It’s like taking a main pasta course and plunking it right in a delicious, brothy vegetable soup. Tortellini are big…substantial…HEARTY. In other words, this was the perfect soup for the kids and for grandma. Amen. I’m not sure how we’ll ever go back to regular noodles. Oh, and did I mention this is made in the Crock Pot? WINNING. p.s. If you ask my mother-in-law to come over for dinner and she finds out you’re serving soup, she may politely decline. She’s not a rude person; she just happens to believe that soup is not dinner. Soup can be an appetizer or perhaps a light lunch but soup is absolutely, categorically NOT dinner. When ready to serve, remove chicken to a cutting board and let rest for 10 minutes. Meanwhile, add tortellini to the Crock Pot (turn to high heat if on low). After 10 minutes, cut chicken into bite size pieces and add back to slow cooker. Tortellini should be about cooked by this time, approximately 15 minutes total. When tortellini is completely cooked, taste and add additional salt and pepper if desired. Remove bay leaves. Serve warm. 10 Delicious Ways To Use Leftover Halloween Candy!